This is my last post for the month of January and tomorrow starts February. I recorded a song today entitled "Somewhere In My past." This song was first popularized by the popular teen idol in the 80's, the late Julie Vega. Later on the song was revived by Divo Mayer, not sure about the date but I think it was 4 or 5 years ago. I found the material in youtube and I downloaded the karaoke and recorded my own cover version. I love this song, The way I understand the lyrics of the song, it was about a soul mate connection. We all have soul mates, either our friends, brother or sister, etc who has a close bond to us. Soul mates anre not necessary romantic in nature. So here's the song "Somewhere In My Past." I spent my time in Angono, Rizal, known as the Arts Capital of the Philippines.for two consecutive days. I discovered the place because one of my Facebook friends posted her photo in the park and that gave me some ideas about the park as I took time to ask her about the place where she lived there. From then, I took the initiative to go there with my agenda to take some photos. Out of curiosity, I googled it and found out from some of the bloggers where they posted their photos. Wawa Park is approximately 15-minute walk from the plaza in Angono. Tricycles are available but I preferred walking since it won't be too long enough to walk going to the park. The park may not meet your expectation but I can say that it's not bad either. Of course it is my intention to go there for photography sake. Now I have found a hub that's not too far to travel and it would help me simulate my passion in photography where I don't have to spend a lot that anytime I could travel since Angono is just a nearby place from where I live. 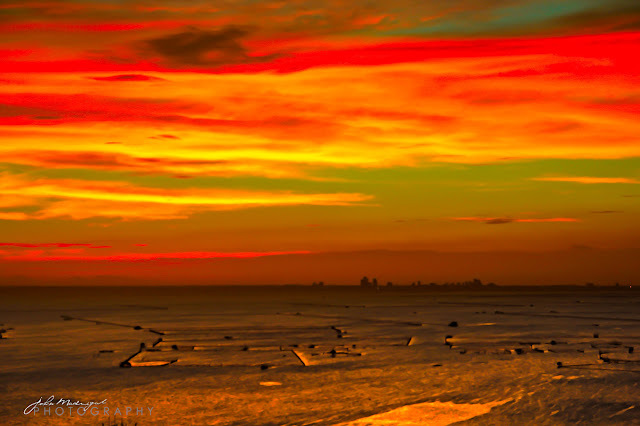 You can see both sunrise and sunset in the place and possibly be good for some landscape photographers like me. I had a dream today and is still fresh on my mind that I need to have my experience documented. My dream was about the aliens attacking the earth where people started to panic. There was an underground escape route as comfort zone to some people to hide themselves from this attack. Seems like it was a high tech, but first you have to go down stair in order to get the elevator. The elevator takes you to the underground train and the tunnel serves as an escape route that will bring you to another place or world. It seems it was a scene from the Battle of Armageddon as described in the bible. Some people were left behind, who were not able to go inside the underground. There were some exit points so you can go up again once you reach another place. Sounds weird and scary though and I think probably my dream was a vision how things would happen in the future. I had another day spent in Binangonan yesterday. I went up to the hill where you can see the big cross and the image of the Blessed Virgin. Just before heading up to the hill, I went pass through Sta. Ursula Parish Church that leads the way to what they call it as Kalbaryo. There were several alternative paths they said but you can't miss the hill once you saw the parish church. About two weeks ago, I've seen the big cross while I was on my way to Talim island via motorboat. So I got curious about it and decided yesterday to go uphill. 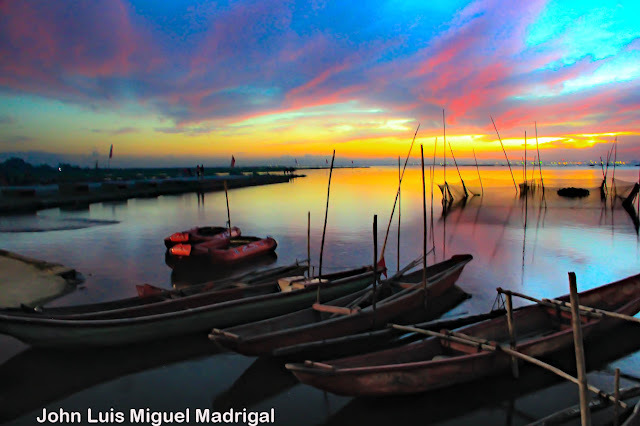 My idea is to get another shot on the setting sun with overlooking to see Laguna de Bay. If you go uphill, you can climb up the stairs but it's not to steep once you step up until you have reached the topmost of the mountain. The stair is similar on the Way of the Cross for it has a station depicting the suffering of our Lord Jesus Christ. I got some good shots though seeing the sunset and it brings different colors to the sky. Since the beginning of the year 2013, I've been trying to figure out places that I want to go, nothing really comes in to my mind when it comes to any destinations I am bound to travel. As my usual routines, I have already visited some places in the past and this occurs especially during seasons. Let me take the case of Marinduque since the root of my family came here, from my father's side. So I go here during Lenten season for the last two years. At this point, this is the only place that I can think of, and some will come as a surprise. Let me greet the people who drop by in my blog a Happy New Year! So this is my first blog entry for the year 2013 and what do we have to hope for in this year. As far as the year 2013 is concerned, I don't want to expect anything but at least I wanna live up with good hopes in my heart. I wanna smile and laugh more, be happy with my life and bring back everything that I have lost. I wanna hope for more travels here and abroad but what I really want to hope for is to go back in New York City, the greatest dream in my life is to live there. Be financially abundant and of course flourish my spiritual growth. I wanna see a bright light shining in a hole and manifest everything that I desire.